At the close of World War II, Adolph Hitler committed suicide rather than face a world not shaped to his liking. So too did high-ranking Nazi officials Joseph Goebbel and Heinrich Himmler. But 23 of the leaders of the Third Reich remained alive to face justice for their crimes. From November 1945 to October 1946, the world watched as the Allied forces tried 21 of those leaders for war crimes and crimes against humanity. In the background, unnoticed by most, was an army chaplain from St. Louis named Henry Gerecke. Former St. Louis Post-Dispatch religion reporter Tim Townsend spent six years researching Gerecke’s story, and gathered what he found into “Mission at Nuremberg: An American Army Chaplain and the Trial of the Nazis,” published in March. He joined St. Louis on the Air from Washington, D.C., where he works as the senior writer and editor for the PEW Research Center’s Religion and Public Life Project. 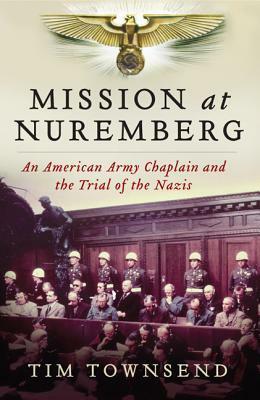 A discussion with Tim Townsend about his new book "Mission at Nuremberg: An Army Chaplain and the Trial of the Nazis." According to Townsend, Gerecke could have cited age ( he was in his 50s) and turned the assignment down. But he chose to accept. Gerecke also understood the full depth of what these men were capable of, having visited the Dachau concentration camp north of Munich several times. “I don’t know if this is figurative or literal, but he said that he would touch the walls at Dachau and his hands would come away smeared with blood, so he knew very much what had happened there,” said Townsend. Gerecke was chosen as chaplain of Nuremberg because he was a Lutheran minister who spoke German and had worked with prisoners before. He was assisted by Father Sixtus O’Connor, who was chaplain to the handful of Catholic prisoners. The two chaplains spent the better part of a year ministering to the 21 prisoners, leading chapel and prayer, and in the end they walked the men convicted to death all the way to the gallows. Among the prisoners that Gerecke ministered to were Hermann Goering and Wilhelm Keitel. Both notorious in their own right; each had a unique response to Gerecke. Goering refused to accept Christ but asked for communion. Gerecke refused, but later worried that he had prevented Goering from an opportunity to repent. In the end, Goering managed to get his hands on cyanide and committed suicide. Keitel and Gerecke bonded over their similar backgrounds, including having sons the same age that fought in the war, and marrying the daughters of brewers. “Gerecke believed Keitel was one that had embraced his faith,” said Townsend. Keitel died on the gallows as Gerecke recited a prayer both their mothers had taught them as little boys. After the Nuremberg trials, Gerecke returned to the United States and continued his ministry to prisoners. He and his wife moved to Chester, Illinois, where he was assistant pastor at St. John’s Lutheran Church and Lutheran Chaplain at Menard, a state maximum security prison. When I saw that Tim Townsend had written a book centered on the Lutheran chaplain at the Nuremberg trials, I knew I would read it. The Rev. Henry Gerecke ended his career in Chester, Ill. There he was assistant pastor of St. John Lutheran Church and the chaplain at the state prison and mental hospital. I graduated from the church’s grade school and relatives work at that prison. But I have no personal memory of Gerecke. He died the year before we moved from the farm into town. And when we lived on the farm, we went another direction to church.